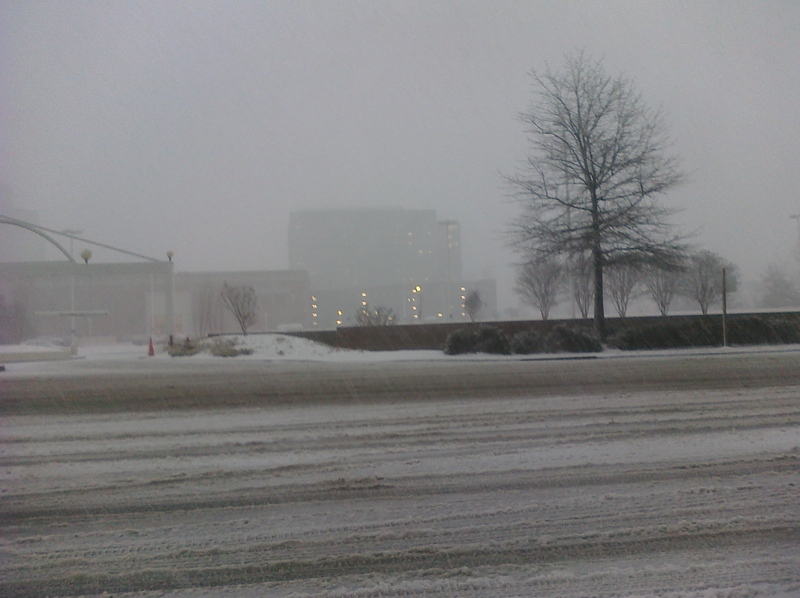 The conditions in Tysons around 4:00 last Wednesday. Last week it snowed in the DC area. This, in and of itself, is not an unusual occurrence, and compared to last year the quantity of snow was nothing, just a few inches. However the nature of the snow (wet and heavy) and the timing of the snow (hitting around 3pm on a workday) made all the difference in the world between last week’s event and 2010’s “Snowpocalypse”. Heavy wet snow brings down branches and power lines as it sticks to everything and anything. And mid-afternoon snow means working out exactly when to leave work and how long it’ll take to get home. There are a lot of horror stories out there about commutes, but since this is my blog, I’m going to tell mine. I left about 3:35 from Tysons Corner. This was, perhaps, the worst possible time to leave. A little earlier and I would have beat most people out the door. A little later and I probably would have given up and had a leisurely dinner with some coworkers, which probably would have been a better idea in the long run. As it was, it took me over an hour to finally establish myself on the Beltway, I didn’t get off the Beltway at Little River Turnpike until 7, and didn’t get home (after leaving my car legally parked, not abandoned I stress, at the start of the subdivision) until 7:35. To find that the power was out. And would remain out until 11:35 on Friday night. The drive home included not just slow traffic, but snow falling almost faster than my wipers could move it, and flashes of light that lit up the sky. I’m not sure which flashes were thundersnow and which flashes were transformers blowing. I’ve been told the blue or green ones were the latter, and there were plenty of both. I’ve never seen the sky glow those colors before, at least not outside of a fireworks show. The next day, I went to work. Largely I was lured in by the promise of the cafeteria being open, hot food sounding so good after a dinner of Pop Tarts the night before. As I drove home, I was on largely the same roads that just 24 hours before had been such madness. By now they were plowed, most of the abandoned cars were gone, and normalcy was returning to Tysons. It wasn’t until then, with the panic of the previous commute well behind me, that I could really appreciate how quickly the mundane can be taken away. And how it all comes back to plot crafting. Shoving the alien into the mundane is a long standing trope of film and literature. It’s really where most of the movie Cloverfield comes from, a couple of people who have to go places they’ve been a hundred times, but with the new reality of a massive creature destroying them and the military counter response. This is obviously an extreme. It can take so little to get us out of our routines and for the world around us to be so very different as a result. Driving north on a road you’ve only ever driven south on before. Seeing a place for the first time in the snow. Discovering that the Metro system has been taken over by the Horsemen of the Apocalypse. Plot can come from any number of changes made to the routine of an every day person and how he or she reacts to the differences. New post up at Unleaded featuring SMBC and me…well, linking right back here again. Maintain Nano pace on any day that I’m not on vacation until I get to the end of Capsule. Then work on editing, oh dare I even say it? End of the Line. Also, came up with an odd idea for a flash fiction piece that I’m hoping to write and post here in the blog by the end of the month. Yay, flash fiction! You are currently browsing the archives for the End of the Line category.